The market for 3D printing technologies continues to climb, and likewise, BCC Research is continually covering new and emerging markets, such as the global market for 3D printing software. Below is an excerpt from a 2016 report on the future of 3D printing. This month, BCC Research is scheduled to publish an update to the Global Markets for 3D Printing report with revised forecasts. Components for the aerospace industry require precision and high quality. AM processes used for lightweight construction in the aerospace segment currently include selective laser sintering (SLS) and electron beam melting (EBM). Engineers still perform design within the manufacturing constraints, but with these techniques, the products are more complex and lightweight. In the beginning of 2014, Swedish manufacturer Koenigsegg presented its Super Car One:1, of which seven copies were ultimately built. This car had several components that were 3-D printed, including side-mirrors, air ducts, titanium exhaust components and turbocharger assemblies. Local Motors, a U.S. company, is developing large-scale 3-D systems and processes to enable the production of an entire car body. In September 2014, the company presented the Local Motor Strati 3-D at the International Manufacturing Technology Show. The car was printed live at the show, using a new fiber-reinforced thermoplastic strong enough for use in an automotive application. The Strati was somewhat crude, and Local Motors is currently working on a new LM3-D model that grew out of an international design challenge. Local Motors hopes to have the LM3-D ready for the commercial market by late 2016. Three-dimensional printing is used in a growing range of medical applications, including tissue and organ fabrication; creation of customized prosthetics, implants and anatomical models; and pharmaceutical research. It has been used to produce bones, ears, exoskeletons, windpipes, jaw bones, eyeglasses, cell cultures, stem cells, blood vessels, vascular networks, tissues, and organs, as well as novel dosage forms and drug delivery devices. The application of 3-D printing in healthcare makes it possible to customize and personalize medical products, drugs and equipment. In addition, 3-D printing can produce made-to-order jigs and fixtures for use in operating rooms. Custom 3-D-printed implants, fixtures and surgical tools can have a positive impact in terms of the time required for surgery, patient recovery time, and the success of the surgery or implant. In the future, 3-D printing may allow drug dosage forms, release profiles and dispensing to be customized for individual patients. Three-dimensional printing technology is also used in the dental industry. Common applications include wax patterns for fixed prosthodontics and models fabricated from intraoral or impression scans. Three-dimensionally printed orthodontics and removable prosthodontics are also gaining in popularity. Three-dimensional printing has also reached the consumer products industry, where 3-D printed jewelry, mobile phone cases, toys, mugs, vases and small sculptures are growing in popularity. Apparel manufacturers have also gotten into the act, with 3-D printed swimsuits, shoes and dresses. The market for glasses frames is also growing with high on-demand custom-fit printable eyewear. The U.S. military is extremely interested in 3-D printing that uses thermoplastics and other materials. 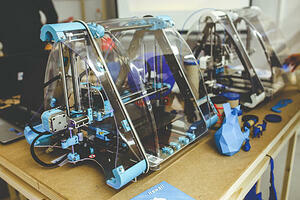 In the future, military units may take portable 3-D printers with them when they deploy. In addition to increasing forces’ operational readiness, this ability to resupply on demand could dramatically reduce the need for resupply missions, along with their costs and risks. Electronics -- Plastic electronic components.